You are here: Home / Featured / Fin whales to firecrests — wildlife extremes on the Wild Atlantic Way. 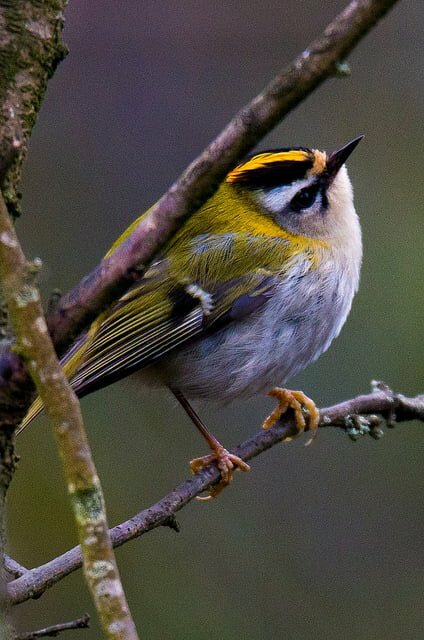 Fin whales to firecrests — wildlife extremes on the Wild Atlantic Way. 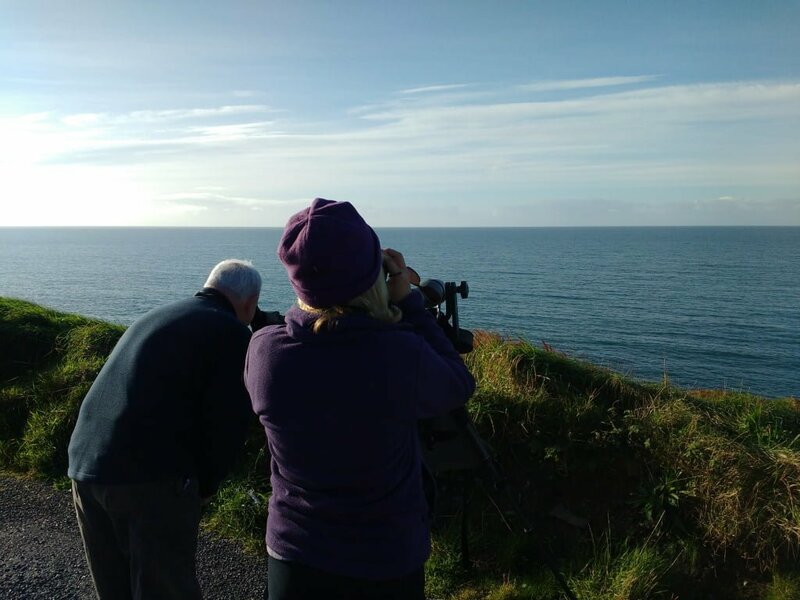 Guests Tony and Tina enjoying stunning views of lunge feeding fin whales off the West Cork coast. The wildlife of the West Cork coast never fails in its capacity to surprise and delight me. It doesn’t matter how many times I head out, or how much (or indeed how little) I manage to see, there’s always something that stands out. Even on those rare occasions when I don’t see much out of the ordinary there’s an entire cast of local regulars that make venturing out a pleasure. They were around today… but today wasn’t one of those days. I was meeting Tony and Tina, a couple from Shropshire in the UK who were holidaying on the West Cork coast. They’d booked a guided Discover Wildlife Experience, and as is my habit when guiding I arrived a bit early to do a bit of reconnaissance. It never hurts to get a feel for what’s about before you hook up with clients. So I drove on past the Celtic Ross Hotel, where we were scheduled to meet, and headed for Cloghna Head, a small elevated vantage point between Rosscarbery and Galley Head that offers a splendid vista across the expanse of Rosscarbery Bay. As I pulled in I saw a puff of vapour out in the bay, then another. 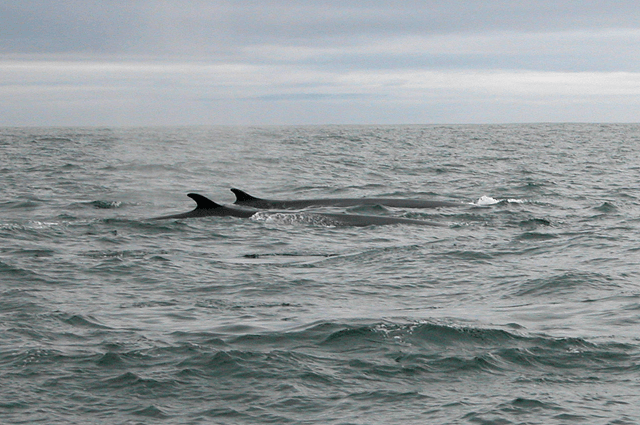 Fin whales, not too far out. There were two animals lunge feeding under a clouds of diving gannets. These huge whales, second only to the blue whale in length, were repeatedly hurling themselves, jaws agape, through dense bait-balls of forage fish (probably sprat) being rounded up by dozens of common dolphins. Thousands of gannets were getting in on the act, along with several minke whales. 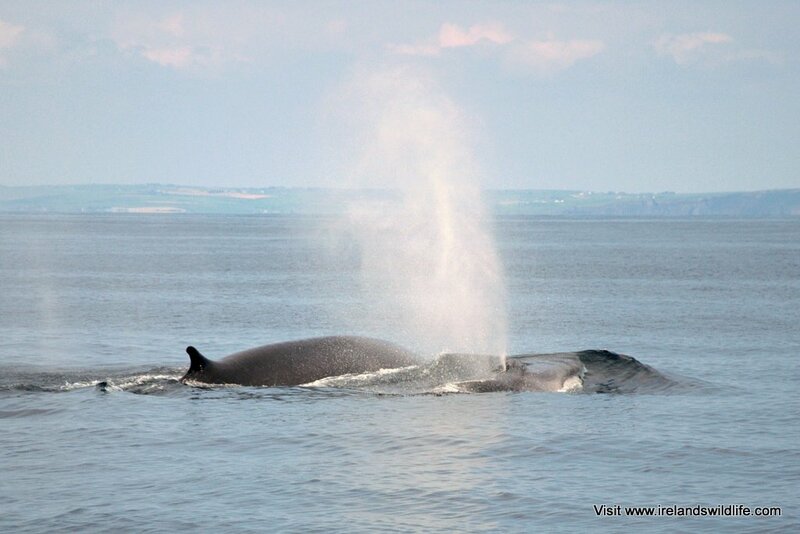 You could see the fin whales clearly with the naked eye, binoculars revealed the supporting cast, and a spotting scope delivered truly breathtaking views of this astonishing wildlife spectacle unfolding. Sometimes you I have to pinch myself and remember that this is all happening just off the south coast of Ireland. Mindful that I had clients to meet I tore myself away from the action and raced (within the speed limits of course 😉 ) to the hotel to make our rendezvous. Luckily they’d arrived a bit early, and we set off, with me praying the whales would still be there when I returned. I needn’t have worried. The two fin whales I’d been watching had been joined by a third, and though the activity had spread across the bay a little, rather than being concentrated in one spot, there was still plenty of activity to enjoy. We watched the action for a good hour, spellbound. Occasionally our attention was diverted by close encounters with the local ravens, including one incident where two of them engaged in an aerial dog-fight with a young kestrel. But we were always drawn back to the maritime drama just off shore. 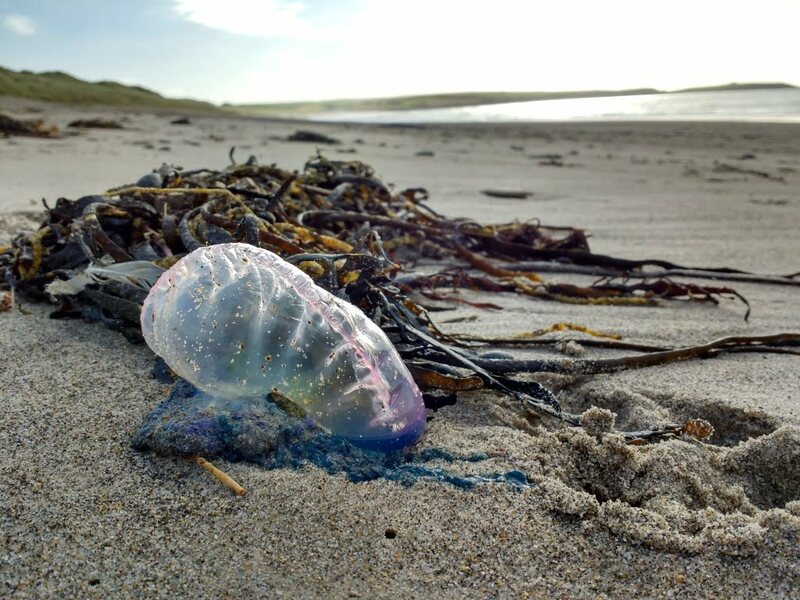 Portuguese Man O’ War… an unusual interloper to West Cork. Eventually we decided to head off to look for more wildlife, and a quick look at long strand revealed a lovely Portuguese Man-o-War. These stunning creatures have been washing up on Ireland’s south coast over recent weeks, and are not actually jellyfish at all, but curious colonial organisms known as siphonophores. It’s amazing what you can find when you take a walk along the beach. There were pipits and wagtails feeding along the strandline, snapping up insects and small crustaceans. Entertaining though their antics were, scanning through them revealed nothing unusual and we decided to move on. Dirk Bay on Galley Head was the next stop — where along with the usual suspects we also saw a few autumn migrants on the move: willow warblers and chiffchaffs, lots of goldcrests, and two firsts for my companions… a yellow-browed warbler and a firecrest. Harbour porpoise in the bay brought our cetacean species for the day to an astonishing four species… from land… in one morning. And then we were buzzed by a merlin chasing rock pipits. Amazing. We finished up at lunchtime back in Rosscarbery with a quick scan of the estuary to add a few waders and wildfowl species to the morning’s list. It had been one of those memorable days when everything just clicks into place… the weather, the wildlife, the company. As I drove home I couldn’t help but wonder if there’s anywhere else in the world where you can see fin whales and firecrests in a single morning? Find out more about Discover Wildlife Experiences from Ireland’s Wildlife here — for regular wildlife updates you’ll find us on Facebook here and on Twitter here. Your description makes it sound great but in fact it was better than that. We can’t thank you enough for the wonderful morning we spent with you. The final count was 42 or 43 birds (43rd was Cormorant, I am sure we saw one but I didn’t write it down). I will send a personal email with the list but thanks again for a very memorable 4 hours. We hope to be back for another go about the same time next year. I forgot to say, the two things you missed in your description were the Kestrel merrily dancing away from the chasing Raven and maybe the fact that the Buzzard was being mugged by Rooks. It’s tough being a bird, what with the Merlin chasing the Pippits too.